First, let me say, that this woman has me hooked! What fantastic books she writes! The Tana French novels (In the Woods, The Likeness, and Faithful Place) are spellbinding! Exclamation points abound! But it is really hard for me to put into words what makes these novels so much more captivating than your average police procedurals. They are, just simply, hands above the rest. French’s novels each stand alone; you don’t have to read the first in order to enjoy the next. She takes a minor character from the novels before and makes them the protagonist. The magic formula starts with a great setting. All these occur in Ireland. And a great time period. While set in the present, all relate back to events in the 1980s. So already this is unique in comparison to your typical New York City police story. And as in the first two, Faithful Place begins with this same recipe. Frank Mackey works undercover. He was mentioned in The Likeness, and I didn’t remember much about him, but like I said, it doesn’t really matter. Because by page 2 I was incredibly invested in his life. I even remarked about this to my BF, because it caught me so off guard. Here I was, two pages in, knowing nothing about the character and nothing had really even happened yet, but I was completely committed to this character. But I digress. Mackey works undercover, he is divorced, he has a fantastic young daughter, and comes from a mess of a family. He is not in touch with his relatives, except one sister who keeps him semi-in-the-loop. He hears from his family, who live in Faithful Place, when a suitcase belonging to his high school girlfriend is discovered. Mackey had assumed she had run off without him. This, of course, left him more damaged than he realizes. Finding the suitcase makes him question his abandonment. What really happened to his love, Rosie? Mackey is too close to the case to be officially allowed to work it. But he also too stubborn to let it go. So he returns to Faithful place, to the neighborhood that has barely changed and the family he tried to escape. French is superb at combining your typical who-done-it with the story of a dysfunctional family and a definitive time period in Ireland. She transports you into the Mackey home, where you feel like one of the Mackey children sitting on the doorstep with your dysfunctional siblings. And you mourn for Rosie, who’s true fate has been hidden for years. I loved Frank Mackey, and the mystery itself is beautiful. And when I closed the last page of the book I was so sad to leave the world of Faithful Place. Anyone who hasn’t read Tana French must do so now! 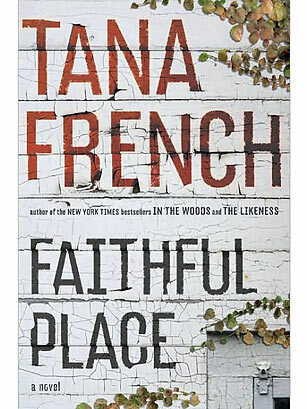 This entry was posted in Best Sellers, Book Reviews, General Fiction, Mystery and tagged book review, Faithful Place, Fiction, Mystery, Tana French. Bookmark the permalink.